The real Brandade de Morue à la Nîmoise : A very special treat. I do not know why this sentence was stuck in my father’s memory, but I would invariably ask my mother why we never had ‘’brandade de morue’’ at home. I do not remember the answer, but I would be ready to guess that my mother, a Swiss from Geneva, was not a big fan of salted dried cod fish, and that this dish never entered her vast cooking repertory, even after 10 years spent before and during WWII in Saint- Hippolyte. When we left Saint-Hippolyte in 1947 to move to Reims, I was barely 7 at the time. And in those days, when we had been deprived of most regular food necessities since 1942, I do not think that this fish specialty was easily found in our town. So, I cannot remember having ever tasted that dish in Saint-Hippolyte, a town located only 35 miles from Nîmes where it is still the only really local culinary specialty of that old Languedocian city. And believe me, you would never find an ounce of brandade in a Northeastern city like Reims. As a matter of fact, until the late 70s, it would have been very improbable to find any brandade in a restaurant outside the areas of Nîmes and Marseille. So I had totally forgotten the brandade when I moved back, alone without my family for the first time, to my native town of Nîmes in 1959, to get my baccalaureate degree there. To secure room and board and make some money while studying there I was hired by a small private boarding pension to take care of young middle-school and high-school age boys from villages outside Nîmes who would live, eat lunch and dinner, and do their home work at night there during the week. but I remember that I found that dish totally revolting, both in terms of structure, gooey and fibrous, and of taste, very fishy and oily. I promised myself never to touch that stuff again. I changed my mind several years later in the 70s when I was now living in Chicago and traveled to France often on business. With my best friend, who is also from Nîmes, we would regularly drive there from Paris to attend bullfights, and spend the week-end in his country house in a village near Saint-Hippolyte, called Lasalle. 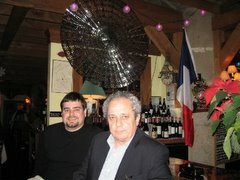 But once I flew to Nîmes on business, and was invited for lunch at a restaurant called Le Magister. The chef-owner, Martial Hocquart, whom I believe still cooks there, was not from that area, but he managed to produce an authentic Brandade de Nîmes, that was a pure delight: Light, very aromatic, unctuous but perfectly balanced. I became a fan of the real brandade and I still love it today when it is well prepared with good ingredients. Nowadays, you find brandade in many good Parisian restaurants, as well as in several good eateries in Chicago. It is offered in several variations, but never according to the original and authentic recipe from Nîmes. Le Bistrot de l’Olivier Rue Quentin Beauchart in the 8th. Now, let’s talk a bit about the origins of La Brandade de Morue à la Nîmoise. Just for the fun of it, I would say that this old and beautiful city, located 706 kilometers South of Paris, 123 Km North of Marseille, and only 42 km North of the medieval city of Aigues-Mortes on the Mediterranean sea, is known for two other things, besides brandade: Its famous Roman arena in the shape of a round amphitheatre, where some of the best bullfighting festivals in Southern Europe take place between May and late September, and the famous Denim fabric, that was invented there under the name of "serge de Nîmes" in the 18th century. It was eventually colored in that well-known blue indigo color. But Denim means ‘’De Nimes’’ (from Nîmes). The big question is: How did cod, a fish that has been for centuries caught in the cold waters of the North Sea and around Newfoundland, close to the Eastern coast of Canada, mostly from boats anchored in Normandy and Brittany’s ports, found its way to the Southern city of Nîmes, that is not even a port on the Mediterranean Sea?. The reason is purely commercial and logical. In the 18th century, there was no refrigeration or freezing equipment on fishing boats. The French fishermen who left on fishing expeditions for several days in the North sea, or sometimes weeks when they were sailing as far as to the North Atlantic fishing grounds of Iceland or Terre Neuve (Newfoundland) needed a way to preserve the ‘’morue’’ (cod) they caught. Fresh cod is also called ‘’cabillaud’’ and it has never been found in the Mediterranean Sea. The only way they knew was to completely cover the fish with salt. In those days the best source of salt was the ‘’salines’’ (salt works) from the Provençal coast of the Mediterranean Sea, and more particularly the Camargue area and Aigues-Mortes, a port city totally surrounded by tall walls and ramparts, from were the crusades departed in the 13th century. The fishermen would bring salted cod as payment, in a bartering system, for the tons of salt that they brought back in large bags to their Northern ports like Saint-Malo or Boulogne. That is how that salted fish became, once desalted and cooked, a very common food on the tables of the department du Gard where Nîmes and Aigues-Mortes are located, as well as cities like Uzes and Alès. Over the years it became a very convenient, cheap and easy way to keep, source of protein for poor people in rural areas not only of Languedoc, but also Auvergne, and the Southwest all the way to the Spanish border, who could not afford to buy meat or pork belly. It is precisely the cook for the archbishop of Alès, Charles Durand, born in that city in the Cévennes in 1766, who was the first to have the idea of blending desalted cooked cod with other major ingredients of Mediterranean cuisine like olive oil, thyme, laurel, and garlic, to make a paste that was continuously stirred with a wooden spoon during the whole process. The verb ‘’brandar’’ in the old Occitan or Provençal language means to stir or to vigorously shake or agitate. The result is a ‘’brandado’’ a product that has been stirred or shake. As I said earlier, there are many versions of that dish, especially since it has been adapted by chefs with various backgrounds all over the world. Nowadays, most traditional brandades are a mix of cod, milk or fresh heavy cream, olive oil, boiled mashed potatoes, garlic, salt, white pepper, nutmeg, and sometimes a bit of lemon juice. Most often it is served with slices of baguette bread pan-fried in olive oil, sometimes rubbed with garlic. It is in fact the Marseillaise version of the dish that is found all over Provence. Brandade started to be a very popular in Paris after 1830. Even more when the well-known writer Alphonse Daudet (Les Lettres de Mon Moulin) started a very popular “Diner des amis de la brandade” (brandade lovers dinner) at the Café Voltaire in 1894. Daudet suggested that cooks rubbed some garlic in the cooking pot rather than incorporating it in the preparation itself as it was done in Provence. Soon la brandade nîmoise became a very common dish all over the Languedoc on Fridays. But even at the time of the French revolution in 1789, it is said that Parisian foodies would go to a restaurant called ‘’ Les 3 frères Provençaux’’ to eat the real brandade de Nîmes. So maybe it was already a regional specialty even before Durand. Anyway, it seems that it is the Chef Durand who launched the commercial success of the brandade nîmoise that was made according to his own recipe and sold in jars or closed pots. Brandade de morue is now very popular in many bistros and home kitchens all over France. It can be covered with breadcrumbs and some cheese and finished to look like a “gratin” in the oven for a few minutes. It can be stuffed in red or yellow peppers, or mushrooms. It is delicious in mini-tartlets as an amuse-bouche. Some people add a touch of sophistication by serving it warm with thin slices of truffles. In Languedoc it is often garnished with black olives and ‘’croutons à l’ail’’and accompanied by a salad of ‘’frisée’’ dressed with a good olive oil and sometimes pinch of crushed garlic. You also now find frozen brandade in ‘’magasins de surgelés`’ (stores specializing in all kindsof frozen foods). One of them, brandade parmentier, is a very popular item at Picard Surgelés. But personally I would not touch it with a 10 foot pole. And of course you can buy Brandade de Nîmes RAYMOND, from RAYMOND GEOFFROY, a company started in Nîmes in 1879, in containers from 100 grams to 1 and 5 Kilos. It will be closer to the authentic original product that any frozen stuff. All of this can be delicious and creative but it is not at all the authentic Brandade de Nîmes, that does not contain any garlic or potatoes. And remember that Nîmes is not in located in Provence but in Languedoc. First you have to find good quality dried salt cod, what we sometimes call stockfish in Europe. The best is sold in wooden boxes. 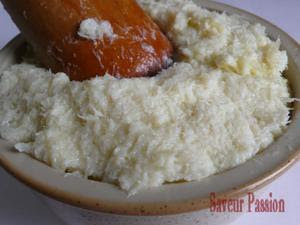 The ideal is to buy about 2 pounds if you want to prepare brandade for 4 persons. The best piece would be close to the head of the fish since it is meatier. Cut it in 2 or three parts. Desalt the fish for at least 24 hours by getting rid of as much salt as you can from the surface and then putting it in a pot, skin up, containing cold water and change that water at least 4 times. When its over, rinse the cod in cold water and drain it. Poach the fish in cold water where you add 1 bay leaf and 2 sprigs of thyme. But this addition of aromatic herbs is optional. Put the heat on and poach the cod very gently until the water starts to simmer. 8 to 10 minutes. The cod should NEVER boil. Drain and put the fish on a board. Delicately remove the bones and the skin rapidly before the fish gets cold so that it does not get gelatinous or look like glue. 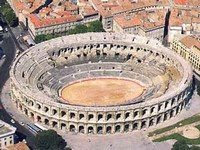 In Nimes originally some cooks kept the skin on because it would increase the taste and the texture. Then coarsely flake the whole thing and keep it at lukewarm temperature in a pot in a corner of the stove. In the meantime you will have warmed in two separate little sauce pans some very good extra-virgin olive oil (just about 1 and 1/4 cup) and about I cup of whole milk. Make sure the oil is lukewarm, not hot, and to remove the "skin: of the milk that should be warm but not hot either. Put the pot containing the cod on very low heat and add a spoonful of olive oil to the pot and, using a wooden spoon, stir it into the cod and crush the pieces of cod again the walls of the pot, then add a spoonful of milk and stir. Continue the process for 12 to 15 minutes by alternating spoonfuls of olive oil and milk until none is left in the saucepans. Never stop stirring. When the mixture is reaching a creamy consistency, add some salt and freshly ground white pepper. Add a pinch of freshly ground nutmeg, and a few squeezes of lemon juice. Make sure there are no lumps in the brandade. Stir again and serve the lukewarm brandade in the shape of truncated flat cone on a plate. Place a couple of black olives on top to decorate. Surround the mound with slices of French bread cut in triangles, lightly fried in olive oil and rubbed with garlic. That’s it. No potatoes, no garlic in the brandade proper. Just the sweet taste of mild cod puree emulsified in good extra-virgin French olive oil. If you want to make a modern version, follow the same instructions up to stage 4. Then in the bowl of a food processor put 2 or 3 cloves of garlic and puree them, then add 4 warm large boiled potatoes and the cod and puree them, while slowly incorporating alternatively your warm olive oil and your warm milk through the funnel of the food processor until both are totally absorbed. Season with the same ingredients as above and make sure that the brandade that you obtained is smooth, not liquid, and not too thick, and without any lumps. Serve with a slightly cool wine like Costières de Nimes rosé, Tavel, or a white Bandol.